Compatibility: Fits 14"Bikes and larger bikes. Turbospoke – The Bicycle Exhaust System, makes your bike look and sound like a motorbike!! 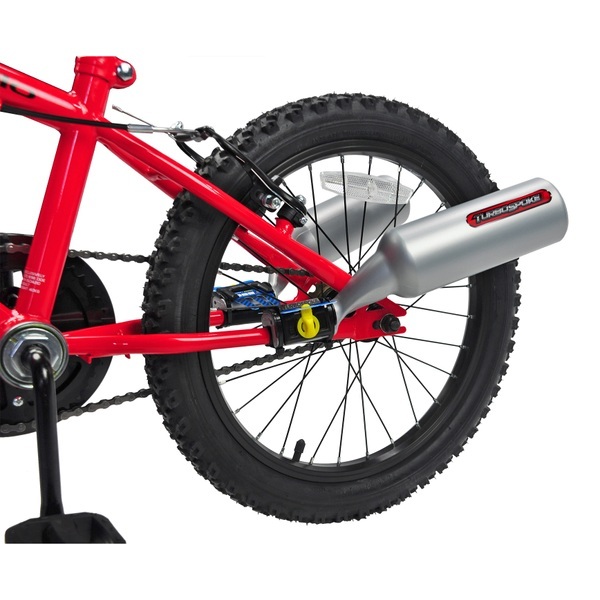 Turbospoke Bike Exhaust V 2.0 is a bike exhaust system that fixes to the back of a pedal bike and makes realistic engine noises. (Bike not included). The exhaust pipe attaches to the rear frame of all 14 inch bikes and larger. As the bike moves, the teeth on the sound card catches on the spokes creating a sound that travels up the exhaust pipe to create a loud, realistic motorbike noise. Each Turbospoke comes with three sound cards which are tuneable for up to six different bike sounds. The fun doesn’t end there. The 24 piece sticker set allows you to customise the look of your exhaust and your bike. Transform your bike into a roaring motorbike with Turbospoke! EU Warning: Not suitable for children under the age of 3 years due to small parts which could cause a choking hazard. Adult assembly required.